Watergate Figure, Evangelist Chuck Colson Dies At 80 Chuck Colson went from being one of the nation's most despised men, who served time in prison for his role in the Watergate scandal, to a hero of conservative Christians. Following a brief illness, he died Saturday at a Northern Virginia hospital with his wife and family at his bedside. 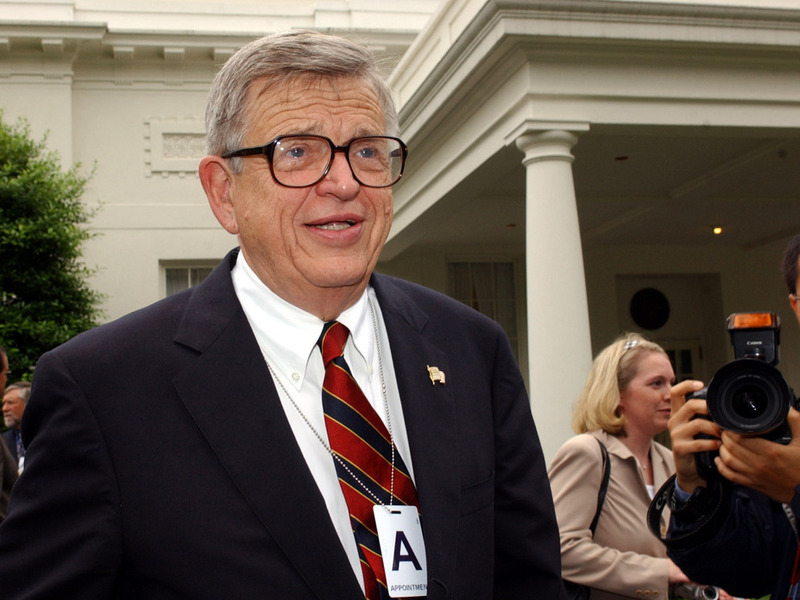 Chuck Colson, speaking outside the White House in 2003, has died. The former aide to President Nixon went to prison for his role in the Watergate scandal. He later became an influential evangelical Christian. Colson passed away at a Northern Virginia hospital on Saturday afternoon following a brief illness, according to a news release from his media representatives. His wife, Patty, and family were at his bedside. Colson was 80 years old. Colson was a 38-year-old lawyer when he found his political calling: working for President Nixon. As special counsel to the president, Colson quickly gained a reputation, says Michael Cromartie at the Ethics and Public Policy Center. "In the Nixon White House, he was a person who said he would run over his grandmother to get the president re-elected," Cromartie says. "He was known as ruthless, calculating; he knew how to play power politics and play it rough and nasty and dirty." Cromartie, who worked for Colson in the late 1970s, says those tactics got the White House lawyer into trouble. Prosecutors charged him in several Watergate cases, including the burglary of Daniel Ellsberg's psychiatrist's office. About this time, Colson later told the Christian Broadcasting Network, he visited a friend who wanted him to turn to Jesus. Colson was unpersuaded, but as he was leaving, he was overcome. "I think about that night in the driveway, when I cried out to God and I realized for the first time what a sinner I was and I realized that Christ died on the cross for my sins," he recalled in the interview. "And I felt so free, but so grateful to God that ever since I'll do anything that God calls me to do." When word got out about Colson's conversion, says biographer Jonathan Aitken, people scoffed. "The world of Washington and possibly the general world thought that this was some sort of Colson public relation trick, but of course now time has told a very different story about that," Aitken says. He took the dynamism he carried into politics and brought it into the world of Evangelical Christianity and became, next to Billy Graham, probably one of the leading spokespersons of Evangelical Christianity in America today. In 1974, Colson pleaded guilty to obstruction of justice and served 7 months in federal prison. He later said prison life humbled him and confirmed his new direction. "I used to look at life from the top looking down," he said. "In prison, you learn to look at life from the underside and you see people hurting and suffering and it has changed my whole perspective." Soon after his release, Colson started Prison Fellowship, which served prisoners and their families. It became the world's largest prison ministry; it's now in more than 100 countries. But not everyone is impressed. Barry Lynn, who heads Americans United for the Separation of Church and State, has criticized Prison Fellowship — in fact, he's sued it and won — for pressuring prisoners to convert to Christianity by offering them better conditions. Lynn says Colson never changed his methods, just his boss. "Sadly, when he went from being Richard Nixon's hatchet man, he turned into a man who thought he was God's hatchet man," Lynn says. "Literally turning these very formidable political skills that he had in the service of very far-right religious and political agendas." Whatever one thinks of Colson, he had influence. His books, including Born Again, were bestsellers. His radio commentaries, called Breakpoint, reached millions. Colson always kept his hand in politics. Cromartie says one of Colson's biggest achievements was born of a friendship with the Rev. Richard John Neuhaus. In the 1990s, the two men began to meet to end the historic hostility between Evangelical Protestants and Catholics. "And they said, 'You know, instead of warring against each other, we have so many of the same concerns on religious values, moral values, social values, why can't we put together a theological statement,'" Cromartie says. "That statement marked a real milestone in Evangelical-Catholic relations that lives on to this day." Biographer Aitken says that in the end, Colson's biggest legacy probably won't be his books or his prison ministry. "I think Chuck Colson's legacy is above all the story of his life," he says. It's a story about a bad man turned good through grace, says Cromartie, making him a force to be reckoned with. "He took the dynamism he carried into politics and brought it into the world of Evangelical Christianity and became, next to Billy Graham, probably one of the leading spokespersons of Evangelical Christianity in America today," he says. And like Graham, Colson lived without scandal — since his conversion.